From our island home in the Pacific, the Punahou alumni network of 36,000 now spans the globe. 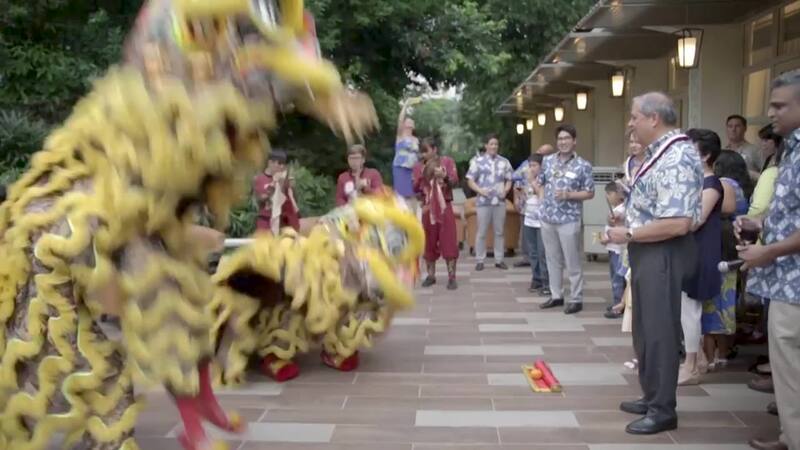 The Office of Alumni Relations, together with Punahou Alumni Association and its 8 regional chapters, help alumni from across the decades to stay connected and serve as a valuable source of support for each other and the School. Join alumni from classes ending in 4 or 9 – as well as alumni from non-reunion classes – to celebrate you, your classmates and the Buff ’n Blue. Connect with alumni anywhere in the world, search job and internship opportunities, or promote your business. Since 1995, Dr. Scott has presented a diploma to more than 10,500 students. Join us in celebrating his 25 years of leadership. President Jim Scott ’70 visited with alumni on the East Coast in November, during his last official trip to the area before he retires from Punahou in June. Punahou’s Boston ‘ohana came together on Nov. 4 at a reception to celebrate President Jim Scott ’70, who is retiring from Punahou School in June. The Punahou community gathered on Thursday, Nov. 1, to honor the woman for whom Kuaihelani Learning Center for ʻIke Hawaiʻi was named, remembering her and her legacy on the date of her passing 110 years ago. Ted Okada ’78 returned to Punahou to discuss issues around recent hurricanes and the projected impacts on Honolulu from these major storms. Happy Halloween, Puns! Add some Buff ‘n Blue spirit to the holiday with custom Punahou pumpkin stencils. A Mexican cantina in Century City was a great locale for a casual networking event for alumni real estate and finance professionals in Southern California. About 40 alumni from the ’70s, ’80s, ’90s, ’00s and ’10s attended. The Punahou School Board of Trustees announced today that Monica Mamiya ’77 McLaren has been named its newest member. McLaren brings decades of experience as an educator to the board, as well as deep personal ties to the school as an alumna and parent. Pacific Northwest alumni rolled out the red carpet to honor President Jim Scott ’70 as he continued his farewell tour in advance of his retirement in June. The talented and accomplished members of our diverse alumni network live and work in communities around the world. They are using their Punahou education as inspiration for leading fulfilling and compassionate lives. Ing’s pioneering research work in the field of childhood visual development has helped countless children. This BuzzFeed News night editor and reporter patrols for breaking news after her East Coast counterparts have gone to bed. His enthusiasm for Punahou know no bounds. This serial entrepreneur, photographer and musician has traveled the globe connecting and engaging alumni. Salt spray, jostling waves and sudden downpours ... for this Hōkūle‘a photographer, these factors are just a part of the job. Each June, more than 3,000 alumni and their guests return to campus for a week of celebration and friendship. Alumni Week is the joyful opportunity to celebrate memories and make new ones and to cement bonds to the School and each other. Kawehi Goto ’11 The most valuable thing about being involved in our reunion committee is keeping our class together and connected, and being a part of something that is so big and so great. Punahou excels because of the generous support of its alumni community, who offer their time and gifts to ensure that the School thrives today and in perpetuity.